IBPS Bank PO Recruitment 2017-18, Institute of Banking Personnel Selection (IBPS) shared a latest recruitment notification to recruit for Probationary Officer & Management Trainee post through their recruitment notification. This is the IBPS Bank PO Recruitment 2017 published job notification for the post of (PO) Probationary Officer & Management Trainee vacancy, apply if your profile match with below job details. Who Can Apply? The candidates who had completed their Graduation can apply for the post of PO Probationary Officer & Management Trainee. 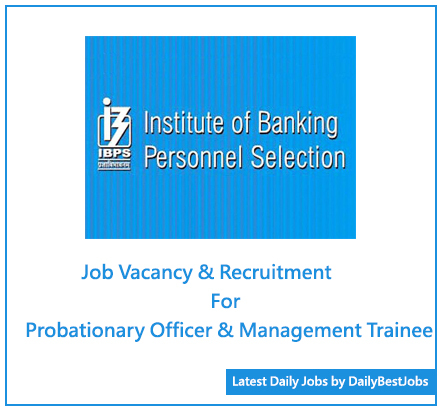 Institute of Banking Personnel Selection (IBPS) is planning to recruit 3,247 candidates for the post of Probationary Officer & Management Trainee. The interested and eligible candidates can apply before 26/08/2017. The application from candidates will allow receiving IBPS online registration mode to IBPS Bank PO Recruitment 2017-18. Eligibility: Eligible candidates have to submit their online application directly to the Institute of Banking Personnel Selection (IBPS) before the 26/08/2017. Find all the below information to know like age, eligibility criteria, salary pay scale, total vacancy, selection process, job details, last date to apply, application process and other useful details. Read all the details related to job before submitting your application and apply online. Address for this job: Institute of Banking Personnel Selection (IBPS), Across India. (a) All the candidates have to apply on or before 26/08/2017 for PO and Management trainee post. (b) You all have to prepare for any written exam and personal interview for the selection which will conduct by IBPS. (b) There is no any further detail info available for the selection process which is not mentioned more in the job recruitment vacancy advertisement. How to Apply in IBPS Bank PO Recruitment 2017? (i) All interested and eligible matched candidates are requested to apply online before 26/08/2017. (ii) Read all the details before submitting an online application form and for that candidates must have to visit the official website of IBPS and register first. (iii) All applicants must meet their eligibility criteria for the said job and apply accordingly for their interest post. (iv) Candidates have to choose an online method to send job application and fill all required details which is asked in job form. (v) Check additional info regarding this job vacancy like application method, eligibility criteria, age limit, salary provide, priority hire, and other alternative required data on the official website. You must remember the last date to apply for this PO & Management Trainee job which have to apply before 26/08/2017. We wish you all the best to candidates who will apply for IBPS Bank PO Recruitment 2017 job vacancy. You can subscribe free for job alert which will directly receive to your email address and apply to a job as per your field. Keep visiting our website in order to know daily best jobs or bookmark our website for a future visit to check the latest government job notifications.